My family has been lapbooking for a few years now. I was introduced to lapbooking when I was looking for something to stay OUT of a textbook and would appeal to my hands on learners! I was delighted to find many choices to help me with providing detailed history and science topics in such an out of the box way! A Journey Through Learning Lapbooks happens to be one of those amazing lapbook companies that I found. One of my favorite details about this company is that it was started by two homeschool momma's that wanted just what I did! They wanted to provide a more hands on approach to learning details and topics that was hands on and visual. I have two very visual hands on kids that lapbooking and unit studies have been wonderful for. 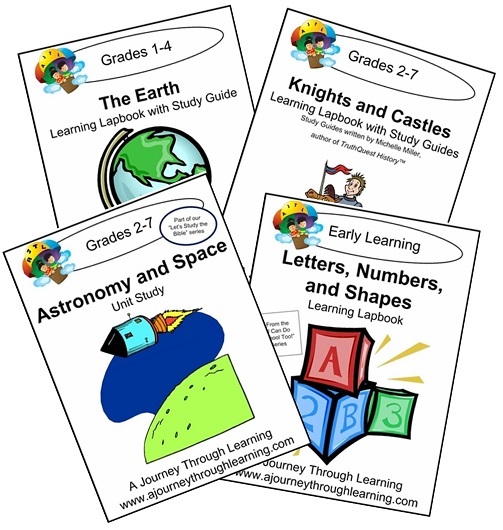 A Journey Through Learning Lapbooks provided The Schoolhouse Review Crew with 3 lapbooks and 1 unit study to review in download format. I personally choose to use Knights & Castles because of the interest from my kids. My kids are in grades 2, 4th and 7th so the age range of the product was right on! However I'm always a firm believer that anything can be altered up or down. Knights & Castles introduced my kids to the Middle Ages. My kids had no prior knowledge before starting this lapbook of the history behind Knights. My boys have talked and played Knights in dress up and in imaginary play for years so it was something that my kids really took an interest in learning. The lapbook file itself is 51 pages long. One of my personal favorite things about this lapbook was that it's from a Christian perspective. This lapbook went from the fall of Rome into the Middle Ages. You will learn about knights, the castles that they lived in and about the life they went through. With that being said let me tell you how I prepared this lapbook for my family. I printed out all the pages once. Then I printed each of the activity pages for my kid's. I do cut things out for them simply because I have one child that gets easily frustrated by doing so and it interrupts the learning that is supposed to happen. I just find it helps to do so. I prepare the activities that are supposed to be in the kids lapbook and place them in a large zip lock baggie. I then label it with their names and they keep up with it throughout the lapbook learning. This particular lapbook requires that you have 3 file folders. I read the information out loud while the kids listened and done the activity at our table. We spent about 30 minutes on the lapbook 3 times a week. This lapbook did take us 1 month to complete. The unit was very complete and dug deep enough to really count as history! If you sign up for A Journey Through Lapbooking newsletter you will get a free 17th Century Lapbook! Which my son has completed and we moved onto 18th century that he has about 1 week left in!! They offer $1.00 express lapbooks! They also offer a $5.00 lapbook each month. For the month of March it is the 60 easy to assemble lapbook templates, which again I own and love giving it to my kids to help with any topic when notebooking on their own! So many people think lapbooking is hard but friends let me assure you there is no right or wrong way to do it! Let go and have fun!